Naive young American learns that not all Middle-Easterners think alike. Truly an awful book. This book was intriguing at first, but became essentially annoying, perhaps disgusting. It goes like this. A young guy, Stanford grad, now working in the State Department goes to the Middle East to get a first hand feel for what’s going on. He spends time mainly in Iran and Lebanon, more of it in Lebanon. His goal is to get to know Muslim youth, and see where they are coming from. It seemed like it was going to be great. Hanging out with Hezbollah activists, hearing their views on key issues, and seeing how they are in day to day life. Pretty wild, his portraits of Islamist militants hanging out at Western fast food joints, dressed in designer clothes, oogling girls. It seems like he’s really going to do something great. Really get at what motivates these people, get into their lives.The problem is he can’t take off his very pro-Israel blinders. He goes to a refugee camp in Southern Lebanon and he can’t see the connection between their squalid conditions and their radicalism. They are just terrorists. The book is basically a pretty thin (metaphorically) volume. It weaves accounts of his experiences with basic(really really basic) background to the various conflicts. Yes, I understand the difference between a Shiite and a Sunni! Well, if he is representative of the latest “best and the brightest” who are working in the State Department. . . worry! Jared Cohen was young when he wrote this, and so can be forgiven some of his more obnoxious asides, but I grew to appreciate his relentless inquisitiveness on political issues, and to appreciate the almost verbatim conversations. Obviously he took the time to make notes shortly after his encounters, so as to remember clearly. I believe the transcriptions are largely true, judging from the ordinariness of most of the responses to his questions. I came to appreciate his eye, as he grew in knowledge as the trip progressed. I see the value in the trip and the writing of it. I think one of the most astonishing revelations for me was the outrageous behaviors of Iranian youth, despite the overhang of the oppressive government we are used to seeing. In addition, the satellite receivers that the desert Bedouin of Syria use was a revelation. These folks don't seem so remote, and I'm sure we don't seem so remote to them, either. Now, if we can just hook up Afghanistan so that they can watch Office if they want. In Jared Cohen’s “Children of Jihad,” Cohen goes out on an adventure to the Middle East in order to delve into the political and eventually social networks of the region. At the time of writing this book, Jared Cohen had recently graduated from Stanford and Oxford and was trying to find a way to better research the Middle East. His book is for people who want to learn more about the Middle East Government and it’s youth. His journey throughout the Middle East was amusing for me to read through. Although at times Cohen rambled off about the labyrinth of Middle Eastern Politics, his adventures that came along with that truly intrigued me, as a student of an International school who wants to understand more about the world. As a young Jewish American in the Middle East Jared Cohen began his adventures in Iran, he quickly made friends who were amazed at his presence and also questioned it. He was amazed at the journey he is taking. He met his first friends at a college, they were sisters and he told them his idea of meeting government officials. She then told him, “Don’t talk to those donkeys, they will only tell you lies, all lies! If you want to learn about Iran, they will tell only tell you the bad things.” This is when he made his decision to talk to youth about their oppressive governments, wars, genocides, nightclubs and even girls sometimes. Although I did wish for him to talk to major government officials, I believe his main focus was to view how the government affected the youth. They youth were very hospitable towards him and always willing to answer questions for him. He made friends everywhere he went and got more information than he thought. I did learn a lot about the Government and the youth, and it was more enjoyable for me. As reading his book, I expected as much out of it as I do anything else. I was looking for excitement, deep understanding, and of course the movement of the book. Jared Cohen’s knowledge of Middle Eastern Government is very dense. However, his way of interpreting and sharing it was very difficult for me to experience at one time. Since he did ramble, I had to read through these parts with more of analytical sense than an enjoyable perception. The most enjoyable parts for me were his small diversions or small adventures. He would always vividly describe them like you were along side him. One moment I distinctly remember was when he woke up in his cab and found himself alone in one of the most dangerous cities for an American to be seen in, Mosul. Cohen remembered and said, “There was literally no other city he could have named that would have been more terrifying.” He soon discovered his driver left him for gas that was 10 cents cheaper on the black market. During these moments I enjoyed reading his book, it was almost like a thriller novel. Jared Cohen did shed some light upon my dim knowledge of the Middle East. One message I clearly received from his book was that the Middle Eastern youth is just like the youth in America, they do disobey the government; they do have electronics and communication to talk with the rest of the world. I did really like the book as a whole, as a student of an international school I could always use extra information on a region I did not know about and this was my way into the region with out having to visit. While I read this book as an assignment for a geography class, I found it interesting and well-written as well as eye-opening. I tend to take the news at face value rather than assume that there is some great conspiracy to keep us on the dark. This book, however, has made me question how the middle east is presented to Americans. Perhaps the news hasn't been hijacked by the government, but how else does one explain the great divide between the observations made in this book and the portrayal of Middle Eastern citizens. To watch the news footage of our war efforts in the area is to assume that there are armed insurgents on every corner and that the entire region wants to kill all Americans. This book definitely breaks down those stereotypes and in fact points out that unlike most Americans, youth in the Middle East are capable of distinguishing between countries, religions, and individuals. Not nearly as smart or articulate as Rory Stewart, a young man who also writes about and experiences the Middle East as an outsider, Jared Cohen has some interesting adventures in Lebanon, Iran, Syria, and even Iraq. If only he were a better writer and had had a better editor! He comes off as a girl-crazy young dude, who has the luck to be experiencing life in the Middle East first-hand as a Jewish American. He's brave and eager to learn, but he also seems like he has a lot more learning and growing to do. Who am I to judge? I could never do what he did. I just think his book would be much more accessible in a more serious tone. Then again, his whole thing is about the youth of today and of the future. He seems to think that cell phones and satellite TV will connect young people all over the world and perhaps save us. Perhaps I'm just turning into an old grump. An unusual look at life and young adults in the Middle East, written by a twenty-something year old american Jew. The auther shares his experiences travelling and meeting with students and young Muslim men and women from Lebanon, Iran, Syria, and Iraq in 2004. Your assumption might be that a young American, traveling alone in the post 9/11 middle east would have an extremely tough time finding ANYONE to talk to him, especially since he didn't hide his jewish heritage. No one would be surprising to hear about some animosity encountered. More surprising were stories about meeting people from the area who were able to separate Americans as people from American government policies which they strongly oppose. As the book jacket states, "Children of Jihad shows us the future through the eyes of those who are shaping it". This is the worst book I've read since, well, since grad school. The only interesting thing about it is the focus on youth, but oops! He fucks it up. He's a Rhodes scholar, so I hope this was really written by a ghostwriter. Fascinating look, good sophistication, credit is due Jared Cohen just for having the guts to go again, and again, and again. He was not to be denied his research. Hear, hear.Well worth the read. In fact, since we as a nation choose to involve ourselves over and over in the Middle East, it would be wise to understand the difference between Maronite, Druze, Sunni, Shia, and the interplay between religion, race, and culture. That interplay changes across every border. It reminded me of Robert Baer's books and a problem we have in the US: these problems, these regions, these issues are not monolithic. It is difficult to penetrate the minds in the Middle East and impossible to do so when the general populace can't understand that an Iranian is not an Arab and don't see eye-to-eye on a whole lot of things. He doesn't just talk with the children of jihad, though. 3 stars is harsh, but the book was light on theme and advice. Don't feel bad, I've docked Thomas Sowell for the same issue. 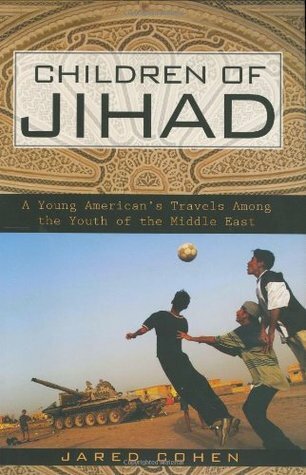 Amazing perspective on youth of middle eastI learned so much about the middle east reading this book ...I was so glad the author gave some background on each region that he travelled to. Even though his travels were dangerous in certain areas, I am so glad to read of his journey. Incredibly inspiring and hopeful. I think any American that is pessimistic about the middle east and it's conflicts and violence should read this book. There is hope in the young people there! They are the ones that can bring peace, it seems like. What it all boils down to is that we are all human, with feelings and dignity and aspirations for life. A 'scratch the surface' effort to understand the struggle/conflict. Underneath it all- we all need the same things- a safe place to live, a government that cares about its people, the ability to earn a living, individual freedom... basic human rights...We could try to understand, but the power of the games lies on the world leaders---unfortunately, most of them are too engrossed with power and greed. Despite it's horrible title, the description of the book promised an interesting read. Unfortunately, the book is mostly about the author showing off his various adventures in the world. Although he tries to escape common stereotypes and emphasizes how youth in the Middle East do not think alike, he yet does not manage to think outside of the box and is caught up in western stereotypes. Fun, yet annoying read! Should not be taken too seriously! Jared Cohen achieves what he sets out to do with this book: to show us a facet of the Middle East that is seldom portrayed in mainstream media. This is the books greatest strength and though Mr. Cohen's account is honest and bold, it comes across as greatly opinionated and reads like a the-natives-are-just-like-us travelogue. The author's intentions seem good, but the book seems to indicate that the sexual practices and general Americanization of the Arab world represents a road to 'liberty'. This is a very insightful book about the middle east through the eyes of a very insightful young Jewish American. His interaction with the youth of Islam makes for a fascinating read. Effective Western leadership will capitalize on the widespread dissatisfaction with the totalitarian regimes that control most of the middle east.It's an excellent read. There was allot of good insight to the Middle East. This book will make you look at things in a different light. Very interesting, and a worthwhile read. Sunni and shi-a are made into concepts that have real, every day meaning instead of geopolitical concepts. The three stars are due to the author, who I find mildly repugnant. He appears to be infected with the narcissism of youth, inserting personal opinion when it isn't useful, and leaving out human perspective when it is. Great book. A terrific insight into the lives and minds of young people living in Iran, Lebanon, Syria and Iraq. Informative and optimistic. Children of Jihad, by Jared Cohen. Produced by Blackstone Audio, narrated by Jason Collins, downloaded from audible.com.Publisher’s note:Classrooms were never sufficient for Jared Cohen; he wanted to learn about global affairs by witnessing them firsthand. While studying on a Rhodes Scholarshipat Oxford, he took a crash course in Arabic, read voraciously on the history and culture of the Middle East, and in 2004 he embarked on the first of aseries of incredible journeys to the Middle East. In an effort to try to understand the spread of radical Islamist violence, he focused his research onMuslim youth. The result is Children of Jihad, a portrait of paradox that probes much deeper than any journalist or pundit ever could. Written with candorand featuring dozens of eye-opening anecdotes, Cohen's account begins in Lebanon, where he interviews Hezbollah members at, of all places, a McDonald's.In Iran, he defies government threats and sneaks into underground parties, where bootleg liquor, Western music, and the Internet are all easy to access.His risky itinerary also takes him to a Palestinian refugee camp in southern Lebanon, borderlands in Syria, the insurgency hotbed of Mosul, and other frontlinelocales. At each turn, he observes a culture at an uncanny crossroads: Bedouin shepherds with satellite dishes to provide Western TV shows, young womenwearing garish makeup despite religious mandates, teenagers sending secret text messages and arranging illicit trysts. Gripping and daring, Children ofJihad shows us the future through the eyes of those who are shaping it. Jared Cohen decided as an American graduate student of international relations at Oxford to travel to the Middle East to do research in the area. He planned to interview government officials for his dissertation. At his first stop, Iran, he was given the run around. Nobody could meet with him, the police harassed him. While he was waiting for appointments to speak with the officials he started informal conversations with the youth of Iran. Gradually he realized that he had access through the youth to a much more informative and interesting view of the common Iranian opinions about America, Islam and their country. As he toured Iran, Lebanon, Syria, and Iraq he asked the youth their opinions of the world. He asked them what their lives were like. This book is the result.Why I picked this book up: Melissa recommended this for our Book Club and I was eager to read and then talk about it. Especially since she served as a nurse in Iraq.Why I finished this book: Cohen is right, we in the West have a limited view of the Middle East. The media is biased, we are busy and the issues are complex. The good news is that it is both better and worse than we know and American youth have a lot more in common with the youth there than we realize.Who I would recommend this to: Mom, Dad, Uncle Andy, Aunt Connie, Allison, Ammon - although you served in Afghanistan I would love to know if you think Cohen's conclusions matched your experiences there. And anyone else who wants to learn a little more about life in the Middle East. This book is a good introduction to the complicated political and religious authorities of some of the most prominent Middle Eastern countries in the news today. He successfully outlines the numerous religious factions in Iran, Lebanon, Syria and Iraq, giving historical backgrounds, counter perspectives and similarities. By interviewing and befriending the youth of this region, he gained a more candid perspective and insight of the turmoil they experienced. But his goal of providing a voice to the Middle Eastern youth was shallow. He illustrated the similarities to their peers here in the United States but this message was repetitive and tiring. I wish he had more personal accounts of the experiences of his interview subjects instead of just including a few brief "sound bites". His most substantial interviews occur in Lebanon with some Palestinian refugee soldiers who reveal their hearts to him but unfortunately Cohen does not dwell long and moves on to the next region.The writing is simplistic but since the topic was overwhelmingly full of historical and religious information it is pardonable. I recommend this book if you are interested in a brief overview of the region and can patiently overlook is shortcomings as a writer. I admire his modern day Indiana Jones spirit but sometimes he was more like a frat boy looking for late night kicks or a naive American tourist. The travel story of a young Jewish American in the middle east. He makes it a point to recognize the difference in the older more conservative generation and the upcoming youth. Not too unlike what I experience in contemporary society in the US. He does include details about partying and just hanging out with people he meets. Not strictly scholarly, but really if that bothers you it's probably because you don't understand the parallel he is trying to draw between the youth here and there. I for one thought it was quite interesting that in many of these countries there is an underground nightlife scene, even gay raves! Some reviewers have pointed out his is Pro-Israeli sentiment. As someone who has neither a pro-Israeli nor pro-Palestinian stance, I did not pick that up. His opinion seems to be that fundamentalist Islamic groups are basically just men with power and blood lust, in disregards to the effects of the very people they claim to protect. Pretty typical human behavior. I feel this book is best read without any religious bias, though that would certainly be hard for the majority of the world. "They all wanted to know the same thing: What do people in America think of Iran? There we were, citizens of two countries that are sworn enemies, all experiencing the same curiousity and eagerness to speak to one another." "'Well, do they know we are not terrorists?' she demanded to know. 'We are Muslim and we are proud of our religion, but that does not mean we are terrorists. Do people in your country know this? '""But you have to promise that when you go back you will tell people the truth about how we are; that we are just like you. ""Young Iranians dream of a change that will bring them opportunity, but they do not want this change to come through violence. ""We are all young, but we are at the mercy of politics and longstanding hatreds. ""He explained, 'We get used to the West, they cover one eye and see by the other. What they see is the violence, but they do not see the context. They don't see that we want to study and get jobs. They don't see that we use computers, and we enjoy movies.'" I have a confession to make: I have never been a history scholar. There are certain periods of history that interest me (the Harlem Renaissance, for example), but those are few in number, and normally don't coincide with anything reinforced in high school or college. I heard the author of this book interviewed on NPR, and I know that I had to read it. It contains the history of places that I (unfortunately) knew very little about, but because the author's own adventures were the focus of the book, I remained constantly engaged. Sometimes I still have to trick myself into learning something. My only criticism is that the author's Jewish descent was mentioned more than necessary. I understand that he is Jewish, and that he expected to be met with prejudice, but this same scenario occurs several times throughout the book. He did, at least, make the point that most of the countries he visited were anti-America, but NOT anti-Americans. And most of all, he made me want to visit a number of countries that had previously just seemed scary to me. What a disappointing book. Some of the major problems: 1) the egotistical author (He went to Stanford and Oxford! He was a Rhodes Scholar! He is very brave and took many risks!) 2) the extreme pro-Israeli bias (I realize that he is Jewish, but if he intended to write about all the youth of the Middle East, he should have found a way to approach them without bias.) 3) the book is poorly written and edited ( I can't count the number of times he was "shocked" -- as in, "I was shocked by the number of internet cafes" and "I was amazed by how much young Iranians did on their mobile phones. ")And the most distressing thing: after writing this book, the author was hired to work in the Department of State and then later at the Council on Foreign Relations. In 2013, he was named by Time Magazine one of its 100 most influential people. I just hope that he learned a great deal between when he wrote this book and when he was earned those honors.Maybe to be fair, I should call this 1 1/2 stars. It's not awful, just disappointing. A fascinating book. The author has clearly shown that not all Middle Eastern youngsters hate the US and that all they ever really want, are opportunities to participate in the building of their countries and their future and be part of the global community.But are the kids he met representative of the majority? Possibly not. The majority could very well be this big bunch of haters, in which case, this book would have been describing an anomaly.That aside, I am uncomfortable with something. Most of the kids described seem to be Muslims by name only, i.e. they drink, do drugs, are promiscuous etc.. It seems to me like a kind of a generalization, a badge of sorts. That if you're a Middle Eastern youth who drinks, or pops Ecstasy or plain horny, then, you must be pro-America or not happy with the government so on and so forth. It's almost a recurring theme in books about the Middle East.That would really be an unfortunate outtake from this book. Thank you for sharing a vivid and incredible experience regarding your journey to the middle east. However, I can't give this book 4 stars. First and foremost, the author mind set is bias and inclined to pro Israel. He failed to see the repression and aggression by Israel is the main reason why Palestinian refugees even exists. I have been supporting 2 states solution for Israel and Palestine just so there is no more bloody war and innocent slain in the middle of it. While he might state that he also support 2 states solution, he stop and continued to being paranoid of getting killed because he's a Jewish and American. I just can't fathom this. Overall, If you're planning to travel or maybe backpacking across the middle east countries, this book can assist you. It gave a brief insight of its culture, tradition, people, history and their political background especially Iran, Iraq, Syria and Lebanon. An outstanding read examining the experiences of a young American as he travels to Iran, Lebanon, Palistinean refugee camps, Syria, and into Iraq, from 2005 through 2006. His experiences provide a glimpse of life in these particularly countries, and his interviews and discussions with the youth in these countries show a side of these individuals that we rarely, if ever, see in our nightly news. In some respects, it is amazing to consider the similarities between young people living there and here, and how some things, particularly resisting authority, be it an older generation or government, seem to transcend cultural and national boundaries. Excellent read, and a must for anyone who wants to begin to understand the history, culture, and politics of the Middle East, for the present and the future. I have to say that this young man has some serious conviction, yearning for knowledge, willingness to party under any and all conditions, and old-fashioned guts. Mr. Cohen travels to places few Westerners will ever experience outside of being stationed there by the military. I learned a lot about the history of Syria, Lebanon, Iran, and Iraq, as well as getting more insight into what always comes off in the media as a religion of extremism and intolerance. Pretty eye-opening stuff. Cohen's Jewish heritage kind of blinded him to some issues, and if it were up to me, I would have Israel dismantled and handed back to the Palestinians. He may disagree, but I wish he could have at least admitted that the Palestinians in the refugee camps had some relevant points. Anyway, a solid read, with excellent research and coherent logic in his historical representations. What can you say about a guy that explored the Middle East as a grad student, following up on exploring warzones in Africa? Cohen's stories are very telling and informative. He shares his deep understand of the history the sets the stage of the current situation in the Middle East and weaves into it what he sees firsthand. It's clear that the world here isn't the one we're told of in the news (and I feel I learned more about the Middle East from this book than from all other sources combined). His discussions on the role of religion and people and institutions are very accurate as well - strikingly consistent with my research in that subject. Cohen writes very well - this is one engaging read.